When the school year began in February, we learned that we would no longer be receiving monthly milk donations for our morning students. This news came as a complete surprise to us because we had received milk for 6 – 7 years and for most of our children the milk that the school provided was often the only nutritional drink they would receive all day. We believed that due to the morning milk and breakfast (either oatmeal or crackers) regimen, last year 100% of our students were at or above the average for their height and weight, so to us it was critical that our kids, especially the younger ones who attend morning classes, continued to receive a daily glass of milk. Again God touched hearts and our students began receiving milk each day. It was so exciting to see them again lining up each morning for their cold, refreshing, and nutritious glass of milk! 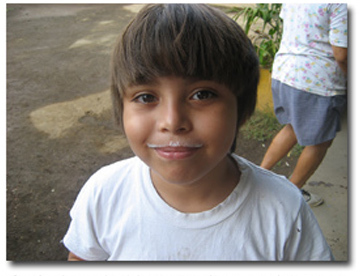 We learned that the orphanage at Tipitapa had also lost their milk donation and through your support we had enough budget money to provide milk for them each day as well, so your generosity is providing a glass of milk for hundreds of children each day. God is good. Even with our increased enrollment God is providing enough food for each student to receive a hot, nutritious meal each day. The morning students receive their meal when they are dismissed for the day and the afternoon students receive their meals when they arrive for classes. The menus are varied but each is high in proteins and for many of our students it’s often the only meal they will have. Rarely will they eat everything at one sitting, they will either save some for a later meal or take it home to share with a sibling so you/we might unknowingly be feeding more than just our students. In any case they are being fed and they are healthy!